“Happy New Year” in Korean is 새해 복 많이 받으세요. New year’s day is called 설날(Seollal) in Korean. It is my favorite holiday! In the past, we only celebrated The Lunar New Year’s day which changes every year. In 2015, Feb 19th is The Lunar New Year’s day. Recently, a lot of people celebrate both(Jan 1st and Lunar new year’s day) but the Lunar New year’s day is more significant for Koreans. We take a day off for Jan 1st, on the other hand we take 3days off for the Lunar New Year’s day. 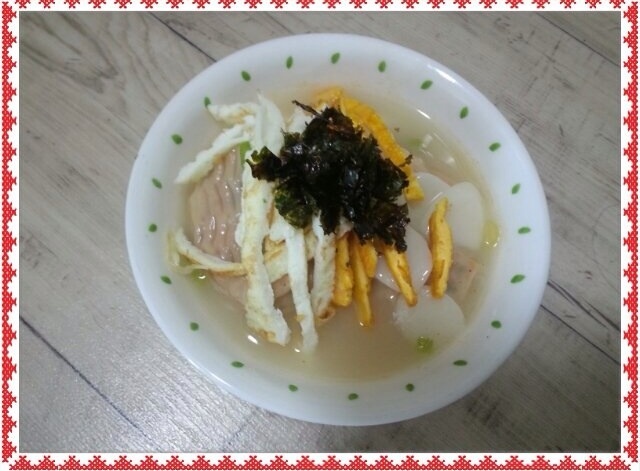 In the morning of the New Year’s day, we cook “Dduk ggook” which is rice cake soup. The reason why we eat the rice cake soup is that the rice cake is long and white which means a long life and pureness. Traditionally, the day before the new year’s day, all family members make dumplings together to add them into rice cake soup. My favorite dumplings are Kimchi dumplings. In early morning of the new year’s day, we dress up with 한복(Han bok) which is Korean traditional clothes and bow to grand parents, uncles/aunts and parents. Then, they give us some money in a small pocket after we bow to them. The bow is called 세배(se bae), and the money is called 세뱃돈(se baet ddon). For a kid, it’s not easy to stay up late, so I fell asleep. Every time I went to bed early, my uncle put flour on my eyebrows, so when I woke up I found myself to become an old lady. I am going to make my own rice cake soup and think about my family in Korea.